SATISFACTION GUARANTEED - If not satisfied with the quality of these books, they may be returned within 30 days for full credit. SHIPPING CHARGES - $11.95 is the MAXIMUM charge per order; we pay all shipping costs over $9.95 ($14.95 west of the Rockies). 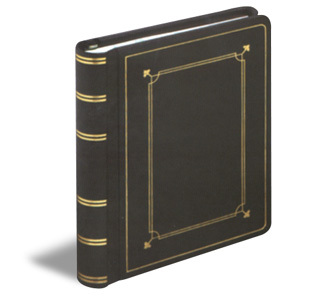 SPECIAL SIZES/STYLES - We can make up any size or type binder you may need. Call / Write / Fax or Email for information and prices. to sheets which are punched for three rectangular posts. 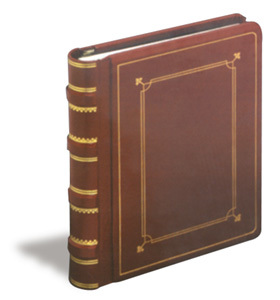 All books are bound over extra heavy binders board. Full black or red imitation leather. Gold tooled front and back covers and spine. Half bound with red leather back and corners. Black imitation leather sides. Gold tooled back and corners, no hubs (also available with hubs). 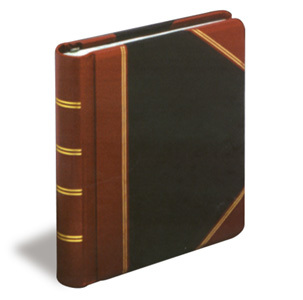 Full bound in top grain red Russia cowhide leather. Gold tooled, regular hubs. Not carried in stock - allow 3-4 weeks for delivery. Larger capacities are available (up to 3") Add $17.95 11" x 8.5" or 14" x 8.5"